Hive were tasked with creating a high impact exhibition design for Pop Up Products for this years trade show. Pop Up Products have exhibited for a number of years at trade shows demonstrating their low level access equipment. They wanted to create stand out and showcase their innovative scissor lifts. So, we came up with the theme of ‘Access More Areas’. We focused on the USP of the Pop-Up scissor lifts, to fit in the tightest of spaces. Along with bright and eye catching wall graphics, we came up with an original giveaway idea. The giveaway included everyone at the exhibition searching around for the stand where they could claim one! 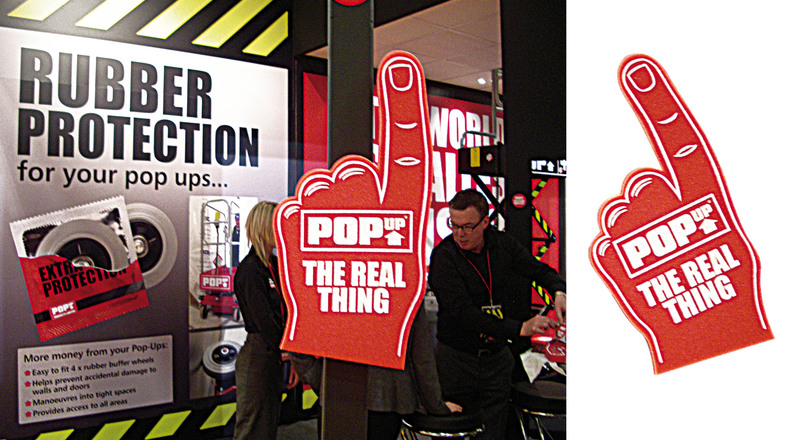 It was a large foam hand pointing upwards to the scissor lifts, featuring Pop-Up’s logo and made in their brand colour. We also created multi use lanyards which contained mini product information cards, which the staff manning the exhibition could easily have round their necks at all times, should someone request product information.